Growing out gray hair may seem daunting, but the process is relatively straightforward. You might choose to cut off the colored hair or slowly ease into your gray by going lighter or with highlights. 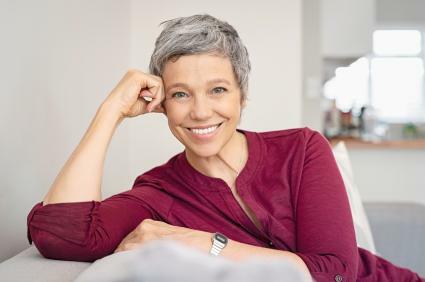 Finding a process that keeps you looking and feeling your best as you grow out grey hair is one key to aging gracefully. Growing out colored gray hair will take patience, but there are some things you can do to make the transition easier. Lightening your hair or adding highlights- if your hair can handle the process - will make the transition less noticeable. Temporary color or a rinse will be easier on your hair and help mask the growing out process a little. Shortening your hair will mean less colored hair remains. Though the process takes time, you will likely be pleased with the eventual results after letting the gray grow out. Before you start growing out grey, change to a blond or light brown shade so the new light gray, silver, or white growth won't be as noticeable. When choosing your new shade, be sure to pick a color that complements your skin tone. Part of keeping your hair healthy requires getting it trimmed regularly, but when it comes to growing out your hair, getting a hair cut also serves the purposes of cutting off the old color. You might want to consider a shorter hairstyle, at least temporarily, while growing your hair out. Short hair will let you accomplish the task of growing your hair out sooner rather than later. Even with the lighter color and shorter hair, as your hair grows the gray will still show. It won't be as noticeable as gray against a darker shade, but it will still be there. Natural sunlight or bright lighting will highlight the gray even more. If you would rather camouflage the new growth a little more, you can temporarily hide it by using a non-permanent hair color rinse. This will wash out over five or six shampoos so it will have to be reapplied until the old color is cut off and the gray is completely grown out, but it does help ease into your new look with your dignity intact. Another way to ease into letting your gray hair grow out is to have your hair highlighted. You can start out with heavy highlights and gradually decrease the highlights as your gray hair comes in. Talk to your hair care professional and ask for her advice as to the best approach. Women who color their hair to cover the gray often reach a point where the gray hairs at the temples, front of the head, or along the part show up faster and in greater numbers than they used to be. The darker the hair color, the more noticeable the gray. There are products to help cover the gray between colorings, or you can choose to color more often. However, all this processing can lead to dry, brittle hair. For these reasons, some women decide that the extra expense, not to mention the amount of time and effort it takes to hide the gray, are no longer worth it. 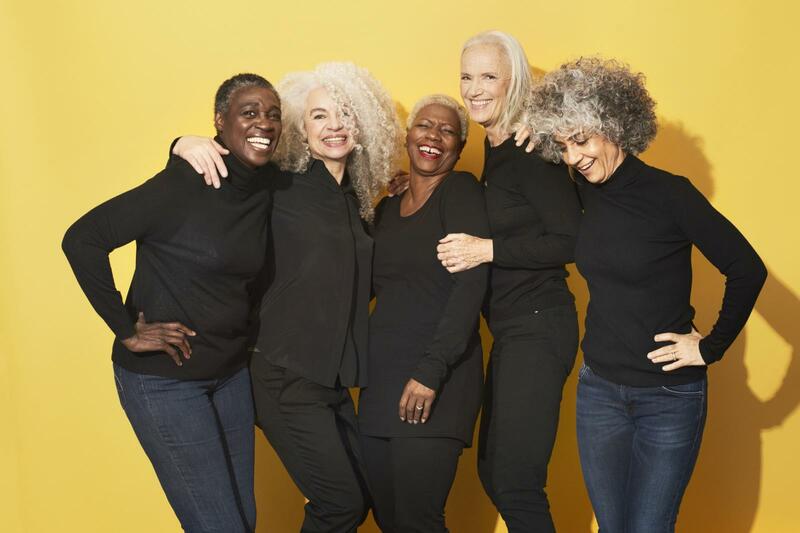 Not only that, but they see other women who look great wearing their natural gray, which can lead women to the big question of how to grow out gray hair and hold on to a sense of style in the process. No matter which approach you take growing out your gray hair, it will take patience. During the process you're sure to get comments from family and friends. Some will think it looks great, while others may say things like, "You're too young for gray hair." As you go through the months it takes to grow out, remember that it is your hair. Don't let peer pressure sway you from what you really want. If you do, you may have to start all over again! Many women are very happy with their new look when they return to their natural color--even though the natural color is now gray. Salt and pepper, white, or silver hair may be a dramatic change, but your natural color is the right one for your skin tone and often makes you look younger than if you dye your hair.